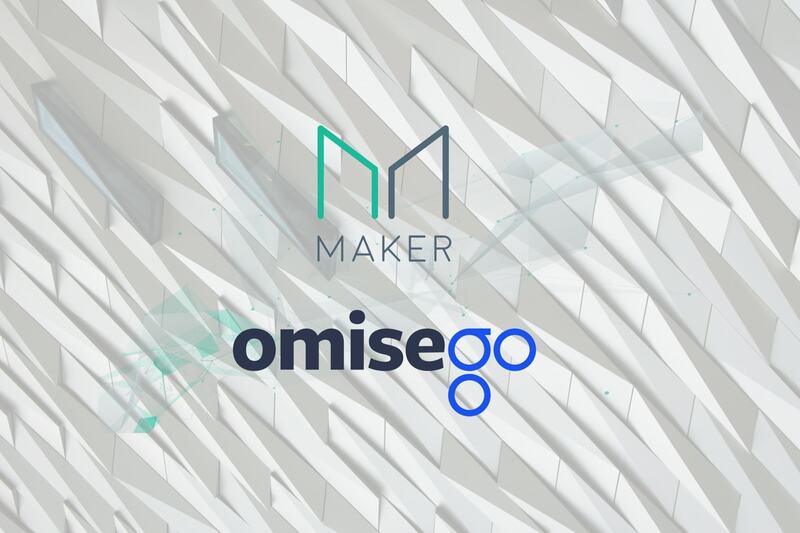 If you follow either OmiseGO (OMG) or MakerDAO (MKR) on Medium you’ll already know that as of April 10, 2018, they’ve come together to collaborate for a more decentralized future. With a common vision of (to use OMG’s words) creating a world with “disintermediated finance”, this partnership makes a lot of sense. Word came from both teams announcing the partnership and confirming continued efforts to work towards their common objective #decentralizedinfrastructure. Maker articulated the common vision they have, saying “together, we believe deeply in a near future that leverages the power of decentralization for trustless transactions.” OmiseGO’s post echoed the same sentiment, mentioning their philosophical and functional alignments. To see the symbiosis of this partnership, one needs only to review a few details about each project. Maker is an Ethereum-based decentralized autonomous organization (DAO) tackling the issue of currency stability through the creation of its stablecoin Dai. A simple way to understand Dai is to think of it as a mix of Bitcoin and Tether. Dai is soft pegged to US$1 — every Dai is intended to retain a value of around US$1 regardless of how much is in circulation. There is a mechanism, utilizing collateralized Ether, that ensures that the US$1 target price of Dai is roughly maintained (more on this below). Maker is also trying to fix ease of use issues with the launch of the “first” decentralized instant trading application, Oasis.Direct. On the other hand, OmiseGO is building a platform that provides a scaling solution for finance on Ethereum. This includes a “currency-agnostic” decentralized exchange that aims to give users the freedom to exchange digital assets at will. Having a stable currency available will likely play a crucial role in this experimental ecosystem. By working together, these two projects aim to use a stablecoin to avoid the dramatic price fluctuations that have plagued many cryptocurrencies, and grow the decentralized financial ecosystem as a whole. In this way OMG/MKR may be the perfect match, but what is this partnership going to mean in real terms? Plans are in place to work together in the following two key ways. In the crypto world, a lot of innovation and adoption has been bottlenecked around price stability, but on this front, OMG appears to be inching forward. People who use the OMG DEX will soon get to add Dai to their list of currency options. Our network users will have the option to hold, send and trade against Dai from day one, gaining the benefits of a stabilized asset without having to rely on a centralized third party to guarantee its viability. With the combination of a decentralized stablecoin and decentralized exchange, the need to worry about single points of failure or whether or not third parties can be trusted goes out the window. Without these concerns, OMG users can utilize Dai as a store of value and as a handy trading pair. It’s also good from Maker’s perspective, as it should help them in the fight for users against competitors like Havven, Tether, USDX, and Basecoin. The value of the Dai token is supported by collateral. This backing is created by securing valuable assets into a smart contract on the Maker platform. This means that any user (if they so choose) can lock in tokens and issue Dai. The first iteration of this was launched in December 2017 and currently requires a user to send Ether to a Collateralized Debt Position (CDP) on the Maker platform. A CDP is software that operates on the blockchain and is housed within the MKR ecosystem. Our next release features multi-collateral Dai, meaning there will be a variety of collateral options that can be used in the creation of a CDP. OMG will be among the first of these multi-collateral options available for CDP creators. As more and more valuable digital assets are created, the more opportunity there is in this vein. This could prove to be the solution to Bitcoin’s volatility problem. News of an OMG-MakerDAO collaboration was greeted enthusiastically in both communities. Omg is really rolling now. First the cosmos hard spoon news, and now a stablecoin like Dai? This is great! Despite this reception, the price of OMG initially showed little indication that a potentially big move had just been made. Perhaps the true impact won’t be felt until the OMG DEX goes live, but in the intervening few days, the price of OMG has zoomed from $9.50 to over $16 on the back of another piece of news — rumors of an API linking OMG to GDAX. Ultimately, the partnership between these two organizations emphasizes one of the core philosophical drivers behind cryptocurrency — the desire to create a decentralized world, free from the tyranny of the financial establishment. Exciting times for both projects.